And, as the book’s first half progresses, what a pitiable state it seems to be in. Corporate machinations are only the beginning, as shifting tastes and demographics, and the effects of taxation and government policy — particularly the much-maligned smoking ban — all take their toll on this quintessential institution. We are introduced to rather too many neglected local pubs only barely outliving their aging regulars, hopeful managers ground down by the low wages and exploitative practices of their pub companies, and themed bars offering the blandest of pre-packaged experiences. Each attracts its share of impassioned jeremiads from a range of well-chosen interview subjects, whose clearly articulated anger seems to be the only source of hope as we fade to black among the bleak surrounds of London Pub (Bloomsbury WC1, fig. 54). Part investigative journalism, part wistful reminiscing, often within the same chapter, the book’s two authors manage to create a very readable narrative which, if it feels gloomy as the first half of the book ends (half-empty), builds a slightly more positive picture with the second (half-full?). It’s exactly the right sort of tone to take with this history, as the institution of the pub is one peculiarly bound up with peoples’ lives and memories. It’s in these encounters, with drinkers, publicans, politicians and pundits — all in the end raconteurs in the best sense — that the book is at its strongest and it makes perfect sense that most of these conversations take place in the boozer (even if this, as the acknowledgements suggest, may not always have been entirely the case). If this feels like the sort of impassioned yet even-handed account of the modern pub scene that any one of us could or should have written, it’s only because the authors’ voices are so very reasonable. It would be a mistake to underestimate the value of this book because of its chatty, friendly, non-hectoring tone, so unusual in most partisan accounts of British drinking. This is a fantastic and beautifully crafted story and I can warmly recommend this book to anyone with an interest in the pub (and surely I can safely assume anyone reading my site will fall into that camp). But what of the perfect pub? If it’s Orwell who sets the challenge, it’s Orwell too who provides a telling clue to the answer. It ends up being the youthful bloggers and brewers interviewed near the end who concede that the quality of the beer or the pub hardly matters in the end. Perfection is an ever-changing set of goalposts, differing from person to person and perhaps not easily summed up in a 10 point list. The key is in the search, and I only hope that search will continue long into the future. 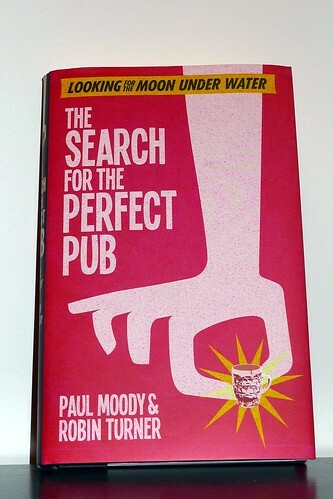 The Search for the Perfect Pub: Looking for the Moon Under Water, by Paul Moody and Robin Turner. This entry was posted in Books and tagged book reviews, paul moody, robin turner. Bookmark the permalink. Ever changing goalposts? Pah, I’m still looking for strawberry-pink china mugs! Okay, maybe I got a bit lazy at the end. Perhaps if I tried beer from a china mug, I’d change my tune. I want to read it !